MA10 Melter/Applicator | Alpine Products, Inc.
MA10 Melter/Applicator is a fast and efficient method for the application of hot applied crack sealants. It can also apply materials from stationary kettles or any large melter. It can be used without heat for cold pour materials. It is capable of melting and applying 600 lbs. of sealant per day. 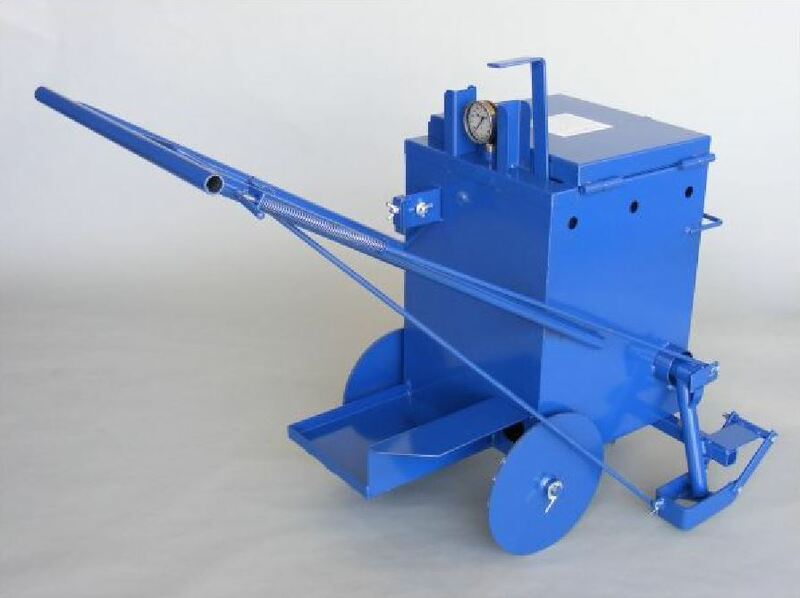 The MA10 is the result of over 25 years of experience in the manufacture and design of melter applicators. Both inner and outer tanks are built of heavy 14 ga. steel. Standard features include temperature gauge with guards, built in hand agitator, 1/4″ thick steel wheels, propane bottle platform, (bottle not included), spring loaded hand controlled release valve, 3″ steel screed, and a stop plate to prevent “stringers” at the end of a run. It comes with 50,000 BTU burner, 6′ hose, regulator, and striker. Capacity – 10 gallon Weight 130 lbs.